Being a military wife is difficult. There is a family to raise and a home to maintain and all the work must be accomplished only by you. But even though there is much to be done, it may seem worth it when reunited with your military love. 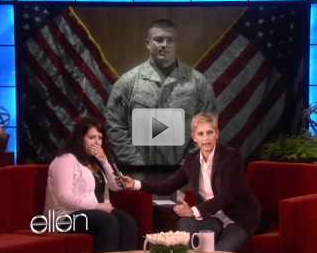 In the clip below, Jessica Gerren was brought on the "The Ellen Show" to share her story. What she didn't know was Ellen had a big surprise up her sleeve. Take a few minutes and watch this heartwarming reunion, but make sure you have a box of tissues nearby.